There are few automotive problems that are more irritating and frustrating that a bad auto headliner. In many early model cars, it is not uncommon for the headliner material to sag or completely seperate from the headliner board. This problem is easy to resolve with a Stock Interiors Automotive Headliner Kit. Our auto headliner kits are made with the Highest Quality Fabric and High-Temp Spray Adhesive. All of our automobile headliner kits come securly packaged, and include a generic set of instructions for all applications. We offer 4 different sized auto headliner kits, and over 30 color options to chose from. These size and color options will allow you to select the correct kit for any vehicle. We also offer additional glue and fabric if you need to fix your sunvisor as well. Please select your desired kit below. If you are unsure of which kit you should buy, please measure your current headliner in your vehicle. You whould add 6" to the length and then round up to the next size. This will verify that you select the correct kit below. Our Small Headliner kit is designed to fit most Standard Cab trucks. To be certain of the length, please measure your current headliner add 6" to the length and round up. The Small Headliner Kit includes 1 yard of fabric and 1 can of Spray Adhesive. Our Medium Headliner Kit is designed to fit most Extended Cab trucks and Small and Medium size cars.To be certain of the length, please measure your current headliner add 6" to the length and round up. 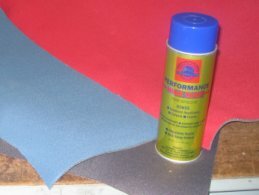 The Medium Headliner Kit includes 2 yards of fabric and 1 can of Spray Adhesive. Our Large Headliner Kit is designed to fit most large body cars as well as most Mini Vans and SUVs. To be certain of the length, please measure your current headliner add 6" to the length and round up. The Large Headliner Kit includes 3 yards of fabric and 1 can of Spray Adhesive. Our Extra Large Headliner Kit is designed to fit most Large SUVs and Full Size Vans. To be certain of the length, please measure your current headliner add 6 inches to the length and round up. The Large Headliner Kit includes 3.5 yards of fabric and 2 cans of Spray Adhesive.